COMPETITION: A pair of Winter Rocks Festival tickets are up for grabs. To be in with a chance of winning them, enter now! After the huge success of Winter Rocks festival 2014, the rock all day event returns on Saturday the 5th December with an even bigger line up of international and rising artists. Keeping to its Sheffield roots, the event will take place at The Corporation: an award winning music nightclub that has been established for over 20 years in the heart of the city. Headlining the main stage will be British rock & blues band THE TEMPERANCE MOVEMENT. 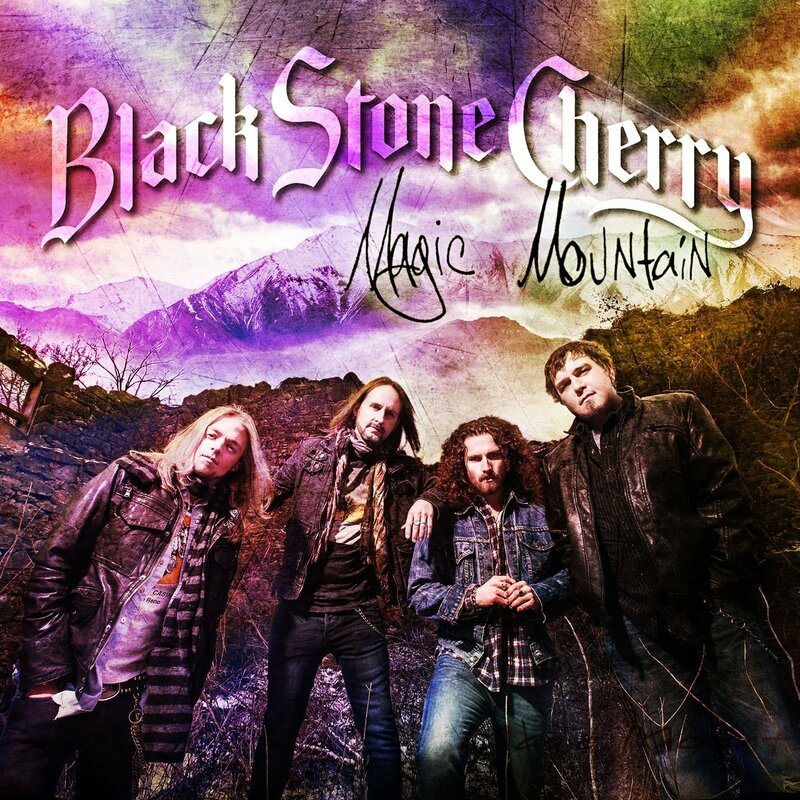 After receiving critical acclaim that as seen them tour worldwide including supporting The Rolling Stones, incredible album sales of their 2013 debut and just poised to release their new album ‘White Bear’ on 15th January 2016, this is guaranteed to be a show to remember from one of the UK’s hottest bands. Nominated for the best new band award by Classic Rock Magazine, CROBOT are a fast rising band with a big reputation. With so much hype and excitement about them, this is a real chance to remember where you saw them first. TAX THE HEAT are more proof of the current thriving UK rock scene. Add in The Graveltones to that mix, the two-piece Australian / London are definitely not to be missed. The rise of female fronted rock bands are in abundance at Corporation this December too with American band SUMO CYCO joining the UK’s THE DIRTY YOUTH and SKARLETT RIOT at Corporation. All now masters of the touring circuit. Also confirmed are BAD TOUCH and FALLING RED, and the rest of the main stage line up to be made up of established international touring artists. The second stage sees a real mix of rising and Sheffield talent with Welsh rockers BUFFALO SUMMER taking on headlining duties. Recently signed LIBERTY LIES will be the main support having opened up Winter Rocks 2014. Winter Rocks 2015 is one event not to be missed. What started as a small idea is now turning into one of the first names on people’s calendars for a quality assured Rock all day festival. Trooper (Iron Maiden Beer) Are the official sponsor and will have a pop up stall as well as having special Winter Rocks Merchandise a nd competitions. Rich Tone Music are also sponsoring the festival and will have a music shop on the day offering tips and advise for any musicians. So, how do you fancy winning a pair of tickets to Winter Rocks Festival? Thanks to guys at The Corporation Sheffield, we’ve a pair of tickets up for grabs. All you have to do is correctly answer two simple questions and your name will entered into the prize draw. (By entering this competition you are confirming you are 14+ years of age). Our Winter Rocks Festival Competition closes today at 9pm! 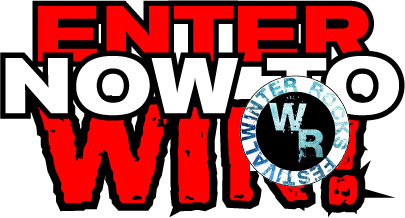 Our Winter Rocks Festival Competition closes today at 9pm. Get your entry in quick! Click here > COMPETITION: Win a pair of tickets to Winter Rocks Festival!. COMPETITION: Win a pair of tickets to Winter Rocks Festival! During ‘The Classic Rock Show’ last Thursday, we gave away a pair of tickets live on-air to one lucky listener. Thanks to the good people at The Corporation, Sheffield, we’ve another pair of tickets up for grabs in our ‘Winter Rocks Festival’ Competition! The Corporation will play host to the first annual Winter Rocks Festival on Saturday, 6th December. The event will mix international artists with up and coming Sheffield bands playing over two stages. THE ANSWER will deliver their stunning live show as festival headliners. Another coup for the festival is hard rockers HEAVEN’S BASEMENT returning to grace Corporation’s main stage. The rest of the line up for the main stage sees a real blend of international talent: Eureka Machines, New Zealand rockers I Am Giant, Zodiac N Black, Swedish legends Stonewall Noise Orchestra, THE Aaron Keylock Band and Liberty Lies. Goat Leaf will headline the second stage with their heavy groove rock show. New Zealand’s Rival State will be main support (Currently on the B lack Spiders tour and gaining Radio1 acclaim). With Sheffield bands The Verals, The Black Hands, Red Jester, Coyote Mad Seeds, Perfect Crimes and Regulus completing the line up on this epic day. 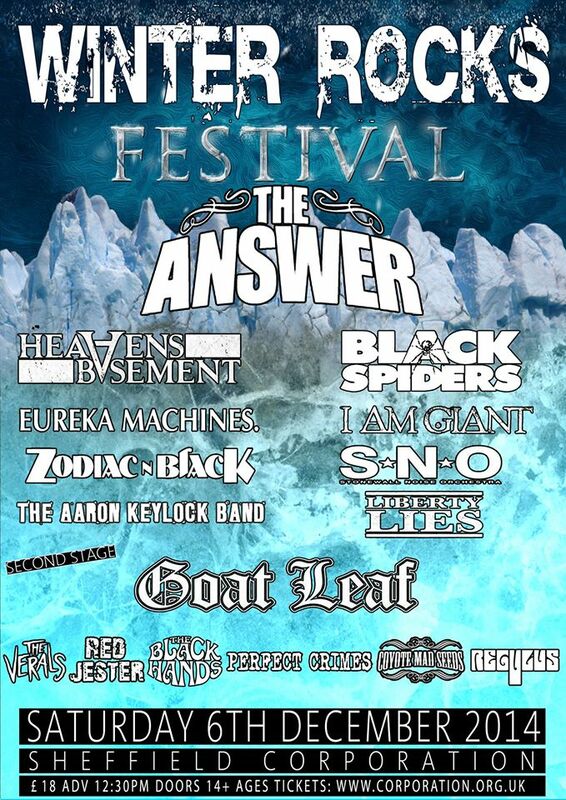 With Eureka Machines, I Am Giant, Zodiac N Black, Stonewall Noise Orchestra, The Aaron Keylock Band and Liberty Lies making up the rest of the main stage line up. Goat Leaf headline the second stage with The Verals, Red Jester, The Black Hands, Perfect Crimes, Back To Verona also confirmed. This is a day not to be missed! By answering the following question, you could be in with a chance of winning a pair of tickets to Winter Rocks Festival which is taking place on Saturday, 6th December!! The ‘Winter Rocks Festival Competition closes on Tuesday 2nd December at 9pm. The winner will be announced at 10am on Wednesday 3rd December. 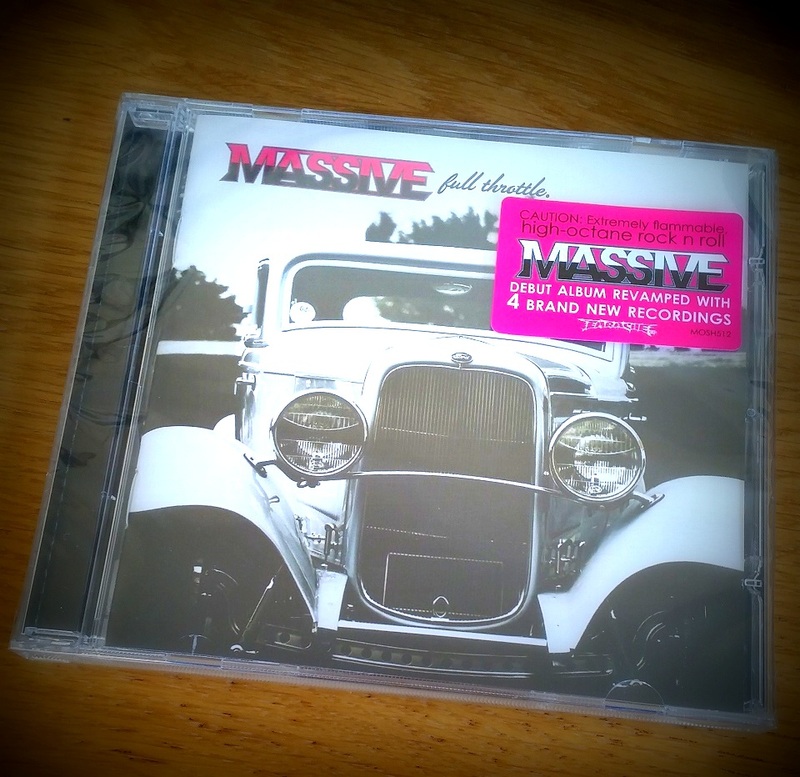 With thanks to the guys in the band Massive and our friends at Earache Records, we’re giving you a chance to win a CD of Massive’s debut album ‘Full Throttle’ which has been revamped with four new recordings and is out July 21st. ‘Full Throttle’ is a breakneck all killer, no filler record which is brimming with attitude. Tracks like “One By One” fuse aggressive and anthemic choruses with fun-filled solos whilst the bass-heavy, testosterone-soaked “Dancefloor” is more sweaty circle pit than glitzy ballroom. The menace and grit of the band comes out in tracks like “Big Trend Setter”, which is an egotistical explosion of pure rock ‘n’ roll arrogance. “Now or Never” is a white-knuckle joyride with enough G-force to make your head spin, and the middle-finger-to-the-man numbers like “Hollywood” will whip up any crowd into an anarchic frenzy. 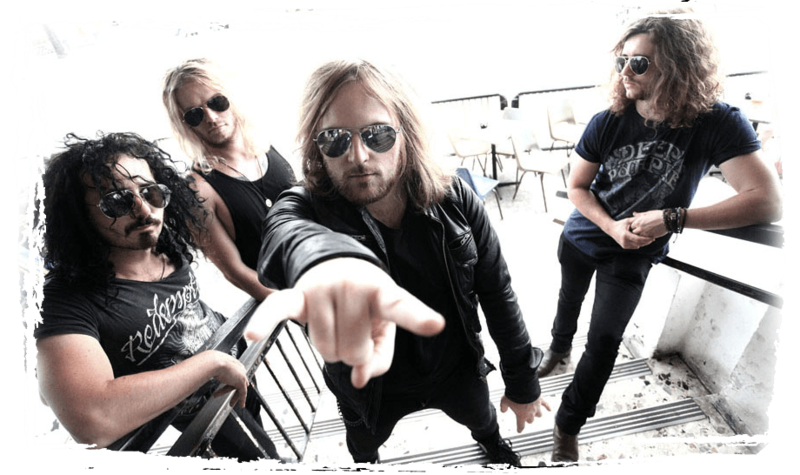 Musically, the band keep it simple and direct, with high-energy tunes set around infectious, rabble-rousing choruses that bring out the rabid rock ‘n’ rollers in the most sterile of crowds. Massive have already been featured on the front of Classic Rock Magazine and they recently stepped into the studio to record 4 more songs to add to “Full Throttle”, including two new tunes and covers of AC/DC’s “If You Want Blood (You’ve Got It)” and Aerosmith’s “Rats in the Cellar”. The band have also confirmed their first visit to Europe, beginning with a slot at the Hard Rock Hell festival in November. We’ve also heard that Massive will be looking to play a few additional gigs around the UK while they’re over. Enter the competition by answering a simple question about Massive’s new album and if you’re correct, you could be in with a chance of winning a copy of ‘Full Throttle’! Name the two bands beginning with the letter 'A' who are covered by Massive on their album 'Full Throttle'? The competition will close on Thursday, July 17th, 9pm (UK time): The lucky winner will be announced shortly after the competition closes, live ‘on-air’, during next week’s show. Sorry, but this competition is open to UK residents only. Fancy your chances at winning #VIP tickets to see #MottTheHoople at London’s O2 Arena? We’re delighted to be able to bring you news of a competition we’ll be running next week to win a pair of VIP tickets to see Mott The Hoople who are playing London’s O2 Arena on Monday, 18th November. The band reformed recently and they’re about to set off on a five-dater of the UK. These shows will be the band’s first since they reunited in 2009 – where they celebrated their 40th anniversary – and you can see them conclude this tour at London’s O2. Stay tuned for more information on this terrific opportunity on our website and via social media.